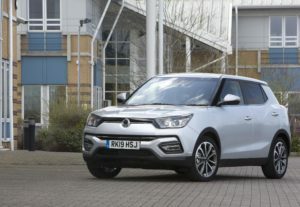 SsangYong is introducing some new enhancements to its compact SUV range of Tivoli and Tivoli XLV. The most significant change is the introduction of cleaner-burning Euro 6 C petrol and diesel engines. The new models are now on sale. Available with either a 1.6 litre petrol or diesel engine, the new Tivoli is extremely well equipped and comes with air conditioning, steel or alloy wheels, cruise control, up to seven airbags, Bluetooth connectivity and remote keyless entry. Prices for the diesel models start from £18,495. Sharing the same platform and wheelbase as the Tivoli, the XLV ‘estate’ features a lengthened body and an expanded load capacity of 720 cubic litres of space. Comprehensively equipped, it also comes with a choice of either a 1.6 litre petrol or diesel engine, and the option of a 6-speed manual or 6-speed Aisin automatic transmission. All models other than the Tivoli XLV receive a freshly styled rear bumper with chrome inserts, AEBS (Autonomous Emergency Braking System), an upgrade to the 7-inch screen, ‘smart audio’ which now includes DAB and Carplay/Android Auto (on ELX and above), which were previously available on the top of the range Ultimate models. All Tivoli models also now feature a variable speed Hill Descent Control while the Ultimate models also now feature ‘auto closing’ linked to the remote central locking. Diesels start at £21,245.